One of the most popular offerings we have right now is Mailprotector’s Bracket Email Encryption service. And for good reason, Since its release Bracket has gotten so popular because it allows you to send encrypted messages without the need for a username / password or the requirement to download special software or install certificates on to your machine or your recipient’s machine. It makes it brain-dead easy to use which non-technical clients and recipients both enjoy and greatly benefit from. Because of the ease of use, many people have changed how they are interacting with the Encrypted email but this has raised a potential concern with how Encrypted messages are sent to end-users. In the past, because encrypted email was more cumbersome, it required a little prep in order to setup an encrypted session with an end user. The notice email that went out to the email recipient was written to prepare them to enter into an encrypted session with you. Either download some software, setup an account, or install a certificate. But these days, through Bracket, the notification email basically says “View Message”. Sending a short notice with a link (no matter how clearly the notice is written) in 2018 can be a hazardous activity for mail deliverability. Email users have been plagued with phishing emails and viruses for years now. Spam filters have gotten so tight, it is difficult for legitimate email to slip through to inboxes and even more difficult to convince pensive recipients to click links embedded in messages. Because of the simple and easy way Bracket operates sometimes users don’t understand what they are looking at and report it as spam instead of clicking the link to read their Encrypted email. The solution to this problem is relatively simple, but it is a human interaction issue – not so much a technical solution. To summarize: you can’t miss the preparation stage when sending encrypted email to people. The first time you send an encrypted message to someone it is ideal to also send a separate email notifying the recipient that you are sending them encrypted messages. They should know that the link you are sending them is safe and will take them to a portal that provides them with their encrypted messages. (A sample email is included below). You can also use the opportunity to tell them how to setup SMS 2FA authentication on their Bracket account (yes end-users can protect their accounts with 2FA even if they aren’t the paying client). Once your recipients are aware of what encrypted emails look like, then they can A.) Whitelist Bracket to make sure everything makes it into their mailbox and B.) know that clicking the link is safe and will protect their information on their email. While this seems like something that you could assume most people would understand intrinsically, you need to realize that email can be hostile territory and many users (especially non-technical users) are scared when it comes to clicking links in emails – no matter how simple and friendly the system appears — especially if the email was not solicited to begin with. So while Bracket offers serious ease of use for the sender and recipient, it can sometimes become a victim of its own simplicity. Adding a simple step of sending a notice about Encrypted email can improve deliverability and make the whole experience much more pleasant. Can you get away without this step? Of course! Most of our Bracket users do. But sending a quick notification and introduction might work around the occasional hiccup that occurs when using Bracket email. 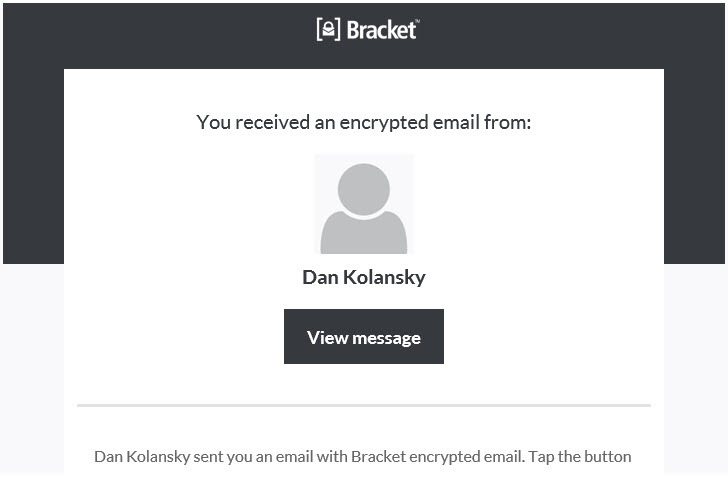 Once recipients know what a Bracket email looks like then you don’t have to send notifications anymore. But the first notice can go a long way to ensuring that your message is opened by the end-user. Just a heads up that I am sending you an encrypted message through our email encryption service. The encrypted message will have a link to a secure portal where you can read the message without us sending sensitive information in an unencrypted format.